Highest member response rate in the GAP, with 61 percent of members in the sample participating in the questionnaire. 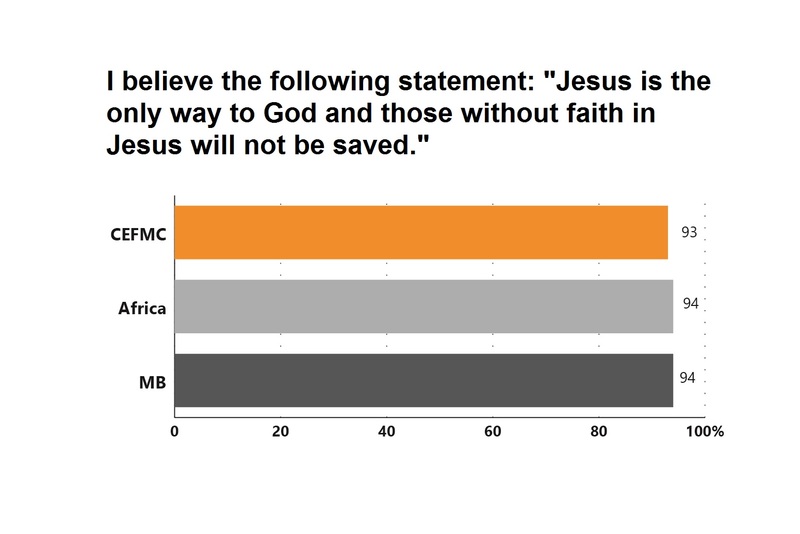 Nearly equal distribution of men (48%) and women (52%) in the final sample, which along with the South African church (Grace Community) is the most even gender distribution among participating African countries. 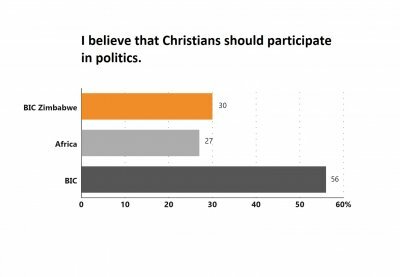 Ninety-six percent of respondents reside in rural communities, making the Malawi BIC one of the most rural churches in the GAP. 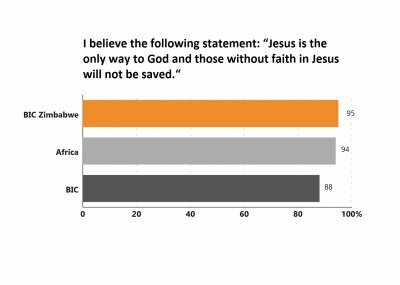 The average age of Malawi BIC members is 36 years, making this the youngest church in our sample, and 84 percent of members are within the age of childbearing—18 to 45 years. 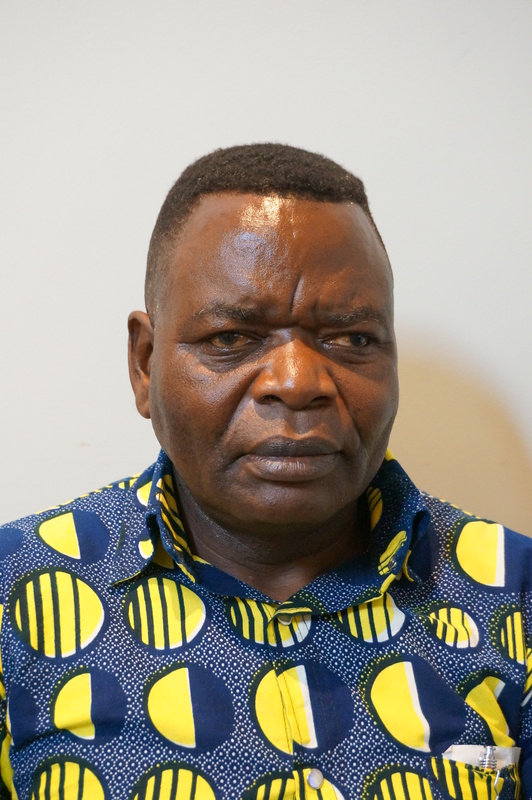 Forty-nine percent of Malawi BIC members are engaged in agriculture—the highest percentage in Africa and equaled only by the Convención Evangélica Hermanos Menonitas Enlhet in Paraguay. 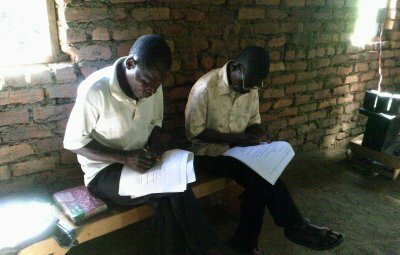 Only two percent of Malawi BIC members reported having graduated from high school, the lowest percentage in the GAP. Fifty-two percent of respondents grew up in a home where one or both parents were a member of Mpingo Wa Abale Mwa Kristu. Forty-five percent of respondents were baptized in a denomination or church other than Mpingo Wa Abale Mwa Kristu. 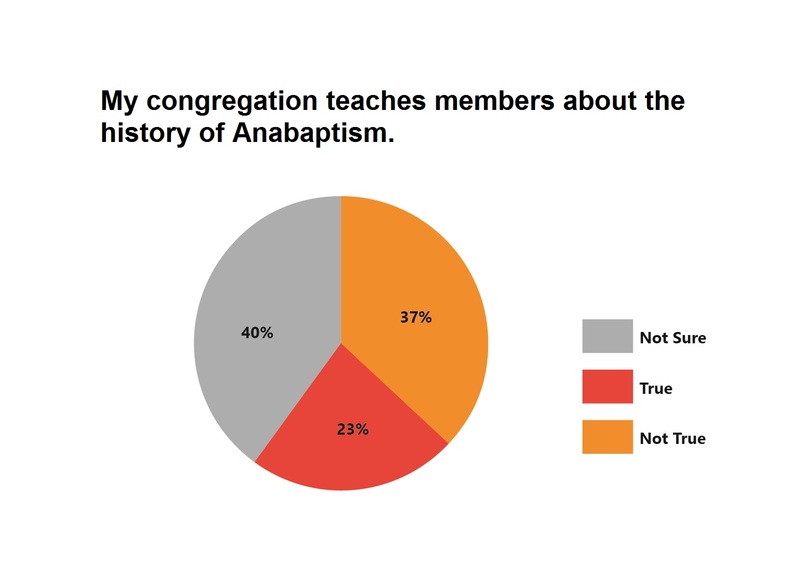 The Global Anabaptist Profile helped us to come up with a real picture of our church and learn what is happening in churches around the world. 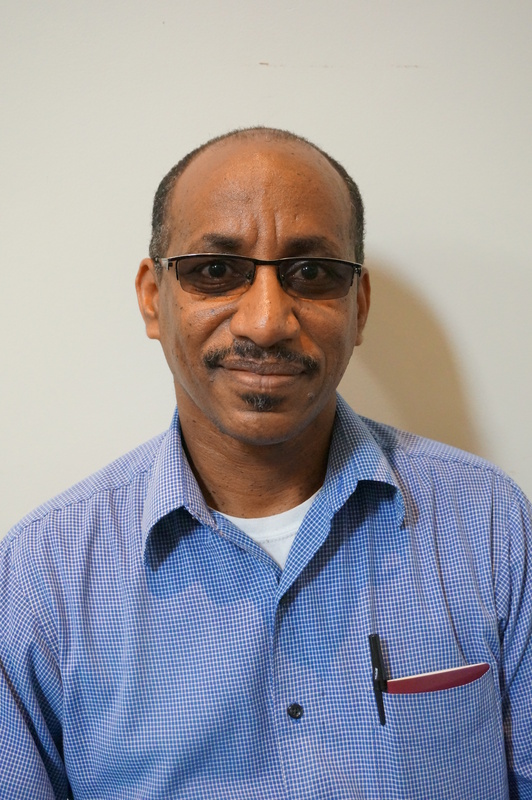 It has helped us to establish new relationships. 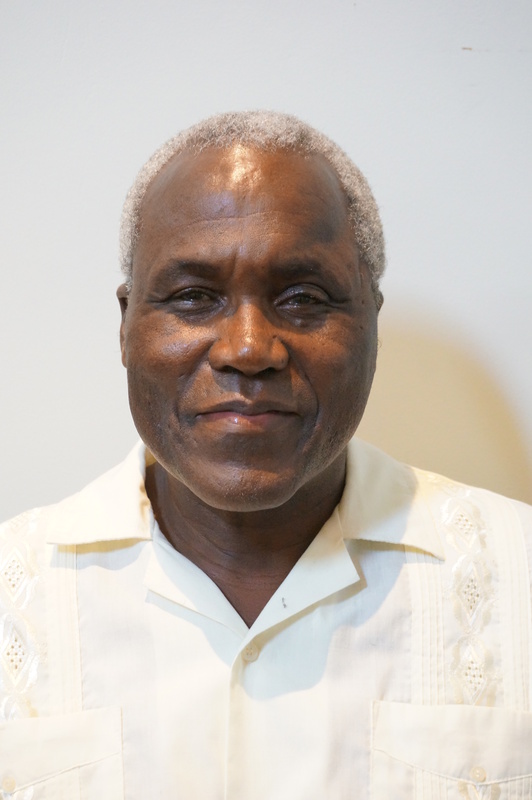 In 1983, a group led by Pastor Sani Selemani Chibwana held regular prayer meetings in Ndirande Township, Blantyre. 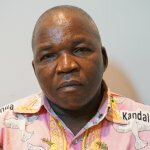 Selemani Chibwana obtained the address of the BIC church in Zimbabwe (Ibandla Labazalwane kuKristu eZimbabwe) and wrote to them, inviting Zimbabwean church leaders to “come over and help us.” The next year the church in Zimbabwe sent Reverends Philemon M. Khumalo and Bhekithemba Dube and their spouses to visit the community in Malawi for the first time. By 1986 the church was registered with the state and counted nearly 500 members. The church in Zimbabwe continued to send teams to Malawi for short visits to teach doctrine and church policies and to perform baptisms. The first Malawian ordained for ministry was Ephraim Disi, who also became the denomination’s first president. By the late 1990s, the church had organized itself into eight regions and begun missionary outreach to Mozambique. Members are active in evangelism efforts, and the church has developed ministries responding to the challenges of poverty and HIV/AIDS. We were welcomed warm-heartedly in each and every home that hosted us in all the churches we visited for the GAP survey. Illiteracy posed a significant challenge, as it was difficult for the Research Associate to verbally administer the survey and collect responses from each illiterate church member. 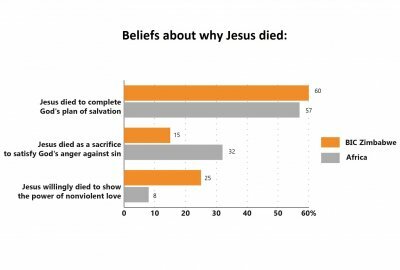 Twenty-four percent of members and 94 percent of congregations in the sample participated in the GAP. 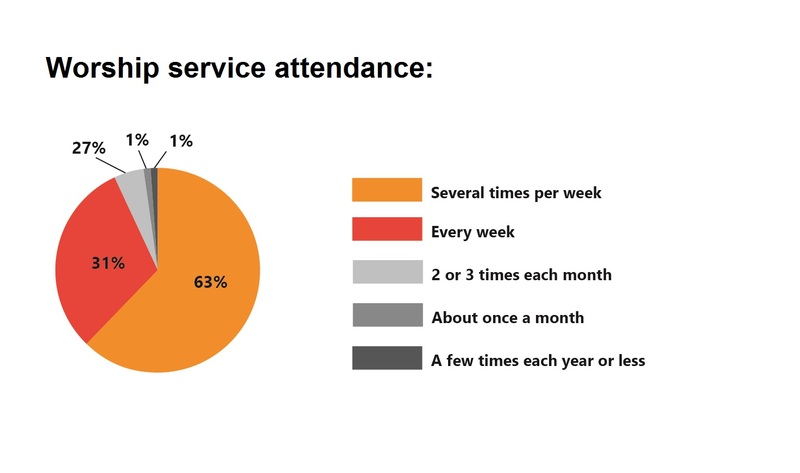 The average membership size of congregations is 86 members. Many more women than men participated in the GAP, with 74 percent of women completing the profile as compared to 26 percent of men. 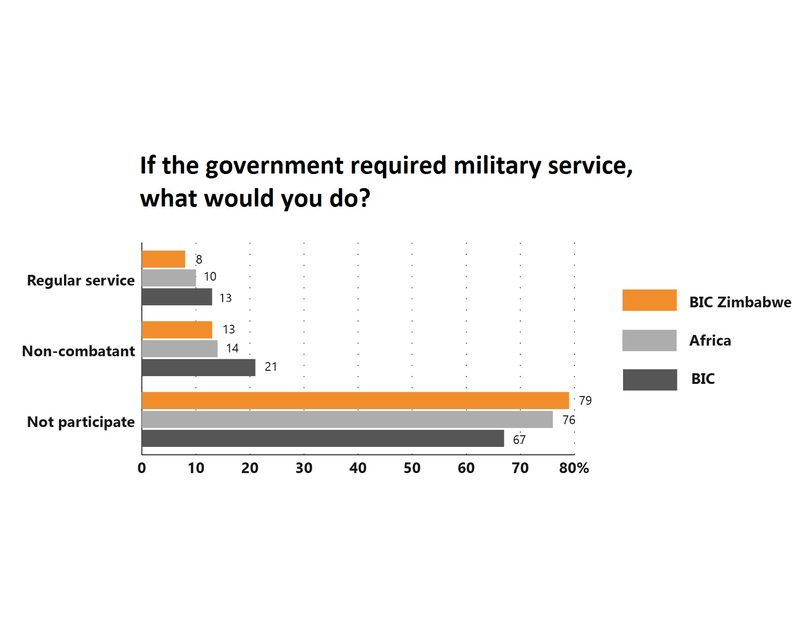 The sample was evenly divided by residence, with 54 percent of members in rural areas and 46 percent in urban areas. Th is is the most even distribution of any GAP church in Africa. The average age of respondents is 47 years—the highest among the GAP churches in Africa. 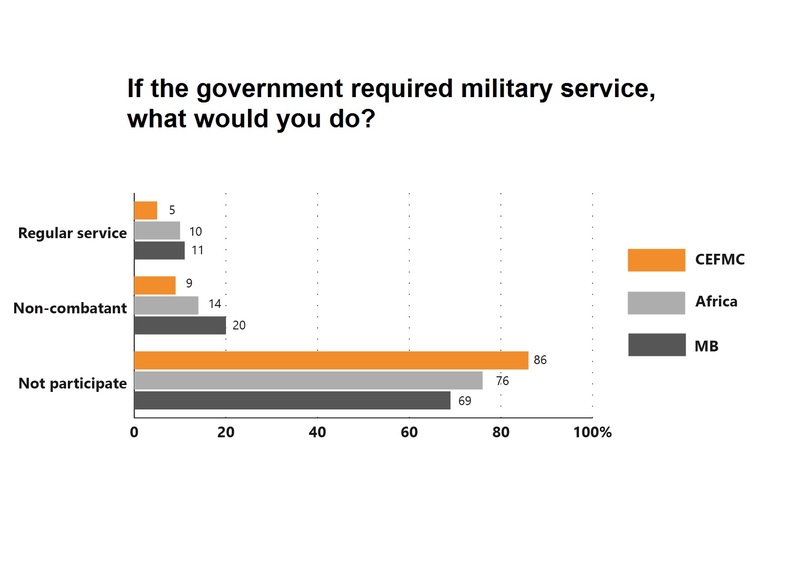 Forty-five percent of respondents are within childbearing age—18 to 45 years of age. 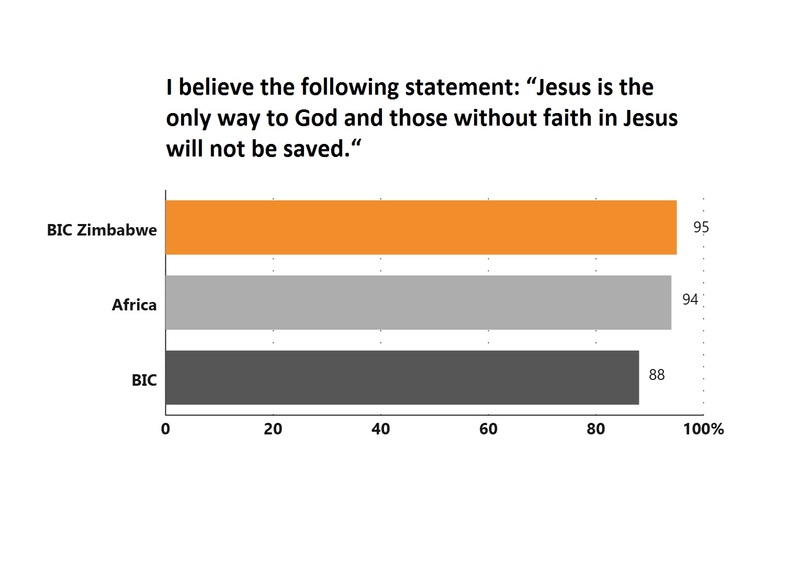 This is the lowest percentage of any GAP church in Africa. Eighteen percent of respondents are widowed—the highest percentage of any church in the Global Anabaptist Profile and much higher than any other participating church in Africa. 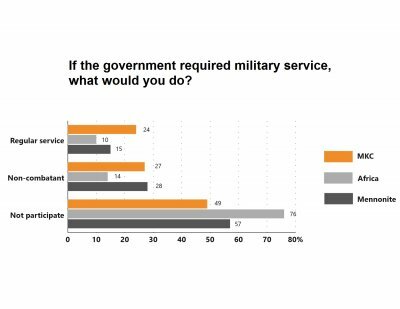 Twenty-nine percent of members are homemakers, reflecting the high proportion of women in the sample, and 33 percent are engaged in agriculture. 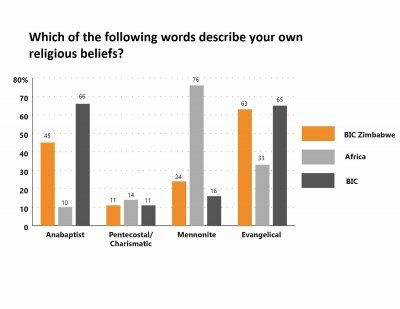 Sixty-one percent of respondents have at least a high school degree—the highest in any African conference except for Meserete Kristos Church. 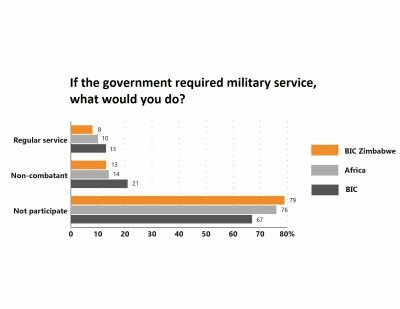 Forty-two percent of respondents grew up in a home where one or both parents were a member of BIC Ibandla Labazalwane kuKristu eZimbabwe. Nine percent of respondents were baptized in a denomination or church other than BIC Ibandla Labazalwane kuKristu eZimbabwe. This process encourages members to look deep into their own faith and what they believe. The first Brethren in Christ missionaries arrived in southern Africa in 1898 and were granted a large portion of AmaNdebele land by Cecil Rhodes, a relationship that often associated the missionaries and their methods with colonialism. Mission stations in Matopo, Mtshabezi, and Wanezi functioned as educational and medical centers, as well as bases for Ndebele evangelists to travel out into surrounding regions. In addition to an extensive primary and secondary school system that served children, a Bible school was established in 1948 to train church leaders. The Bible school continues today as Ekuphileni Bible Institute. The denomination became independent from the mission in 1964, and national church leaders assumed positions as overseers, trustees, and bishops. 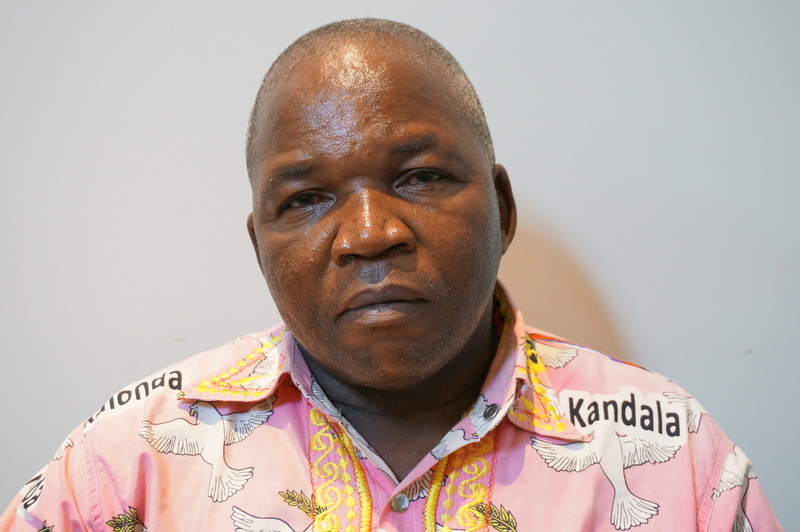 In the period surrounding national independence in 1980, many in the denomination were targeted because of their Ndebele ethnicity and visible church engagement. The stories of church leaders refusing to fight back and persevering in church work continue to influence the church’s peace witness today. 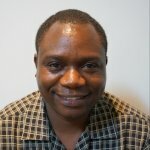 Church planting has remained central to the church’s mission, and the denomination has helped establish churches in both London and Malawi. 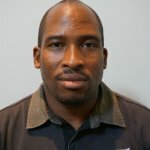 The church in Zimbabwe also maintains strong connections with young people who have left for opportunities in the United Kingdom and South Africa. 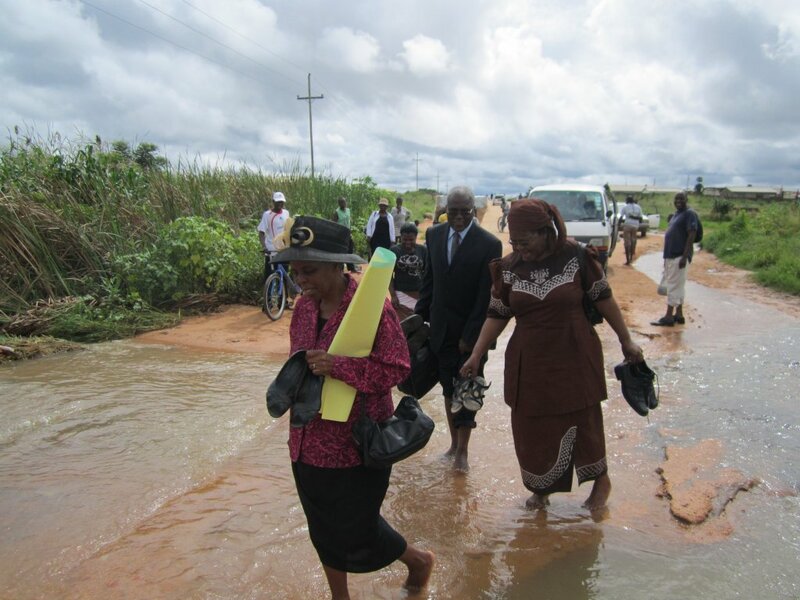 The survey was implemented during the rainy season, and flooding sometimes disrupted travels plans for Research Associate Jethro Dube and Doris Dube. 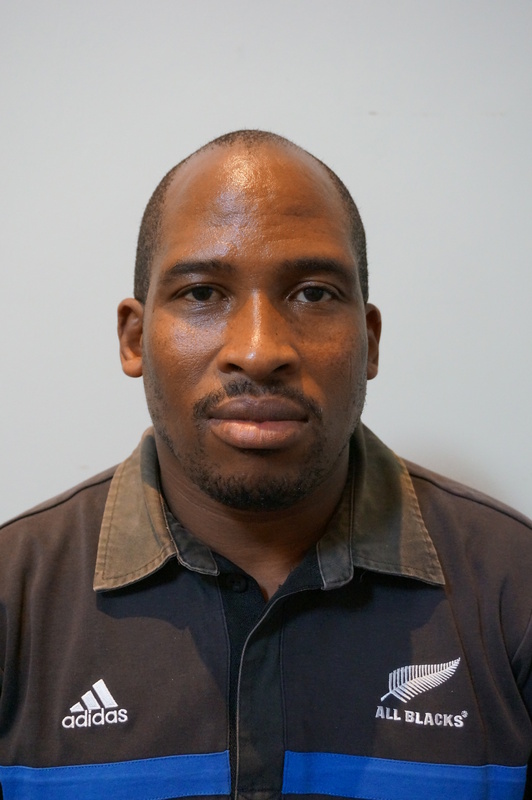 The survey was implemented during the rainy season, and flooding sometimes disrupted travels plans for Research Associate Jethro Dube and Doris Dube. Thirty-one percent of members in the sample participated in the GAP—this percentage was impacted by the high level of illiteracy among women in the CMC church. The final sample consisted of 30 percent women and 70 percent men—a distribution impacted by the illiteracy of Congolese women. Sixty-seven percent of respondents live in rural communities as compared to 33 percent in more urban contexts. The average age of respondents is 45 years, with 50 percent being between the childbearing ages of 18-45 years. Five percent identified their marital status as polygamist. 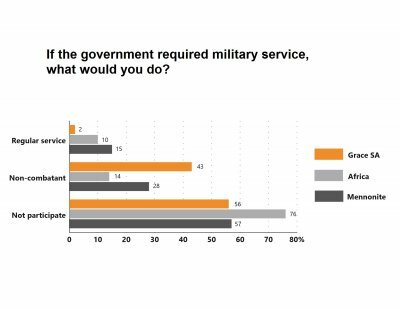 Eleven percent identified themselves as homemakers (likely a reflection of the gender imbalance), while 34 percent are engaged in agriculture and 39 percent are professionals. Twelve percent indicated that they are involved in church-related work, one of the higher percentages of churches in the GAP. Fifty-seven percent are high school graduates and fourteen percent graduated from college. For 67 percent of respondents, one or both parents were members of Communauté Mennonite au Congo when the respondent was a child. 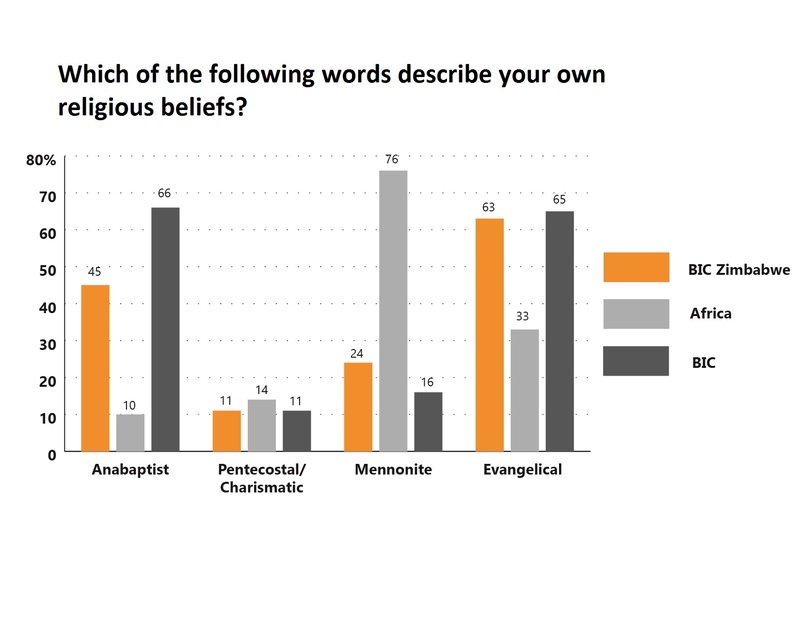 Sixteen percent of respondents were baptized in a denomination or church other than Communauté Mennonite au Congo. We were struck by the hospitality of the church members who received us. They welcomed us into their homes and shared their meals. We spent no money on food and lodging. 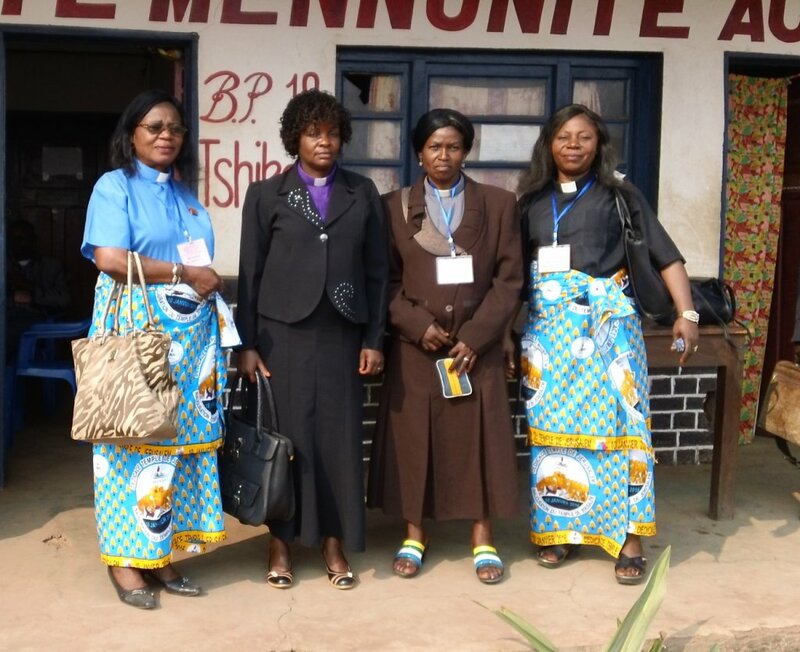 The Communauté Mennonite au Congo traces its origins to 1911, when the first North American missionaries associated with the Congo Inland Mission arrived in Congo, during the period of Belgian rule. Missionaries oversaw eight mission stations, which were centers for education and health ministries, while Congolese catechists and translators were primarily responsible for evangelism and church planting beyond the confines of the mission stations. Rising frustration with the colonial system led to revolution and national independence in 1960. 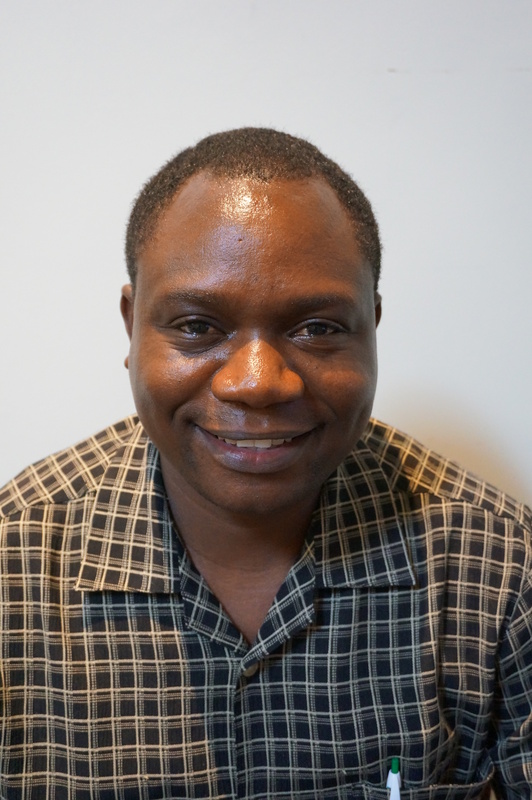 Under pressure from authorities and fearing for their safety, Mennonite missionaries left Congo within a span of two weeks following independence on June 30. 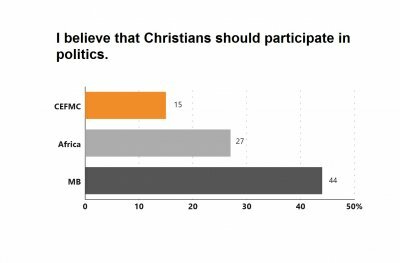 Although many in the church felt abandoned, it proved to be a formative period in developing Congolese leadership, as church members assumed new responsibilities. Even after the missionaries returned, Congolese leaders continued to make decisions collaboratively with North American colleagues. 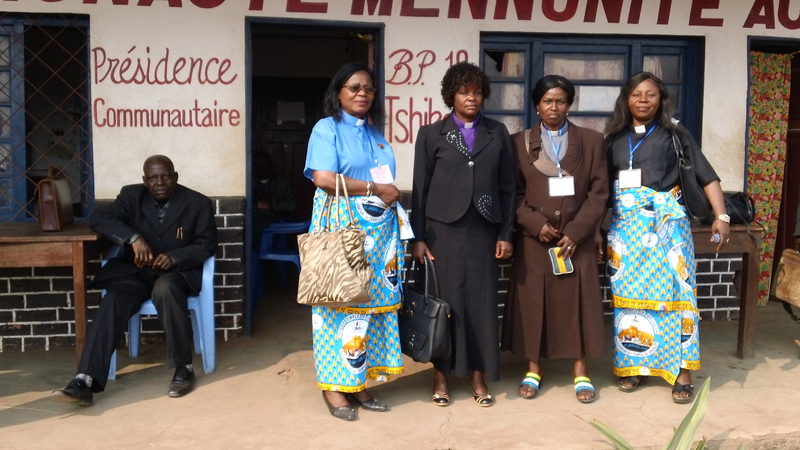 The Communauté Mennonite au Congo became fully independent in 1971. Church expansion from the rural areas into the cities followed independence, leading to greater contact with Pentecostal and traditional renewal movements. Throughout these changes church planting and evangelism have remained central. 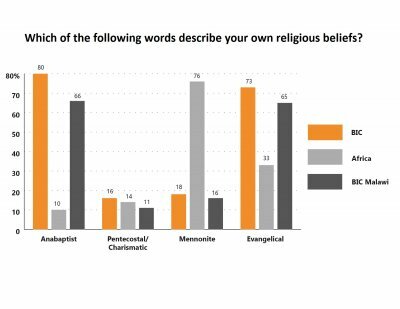 During our time consulting at Elizabethtown College we found that Mennonites worldwide have almost the same belief and practice despite some differences. 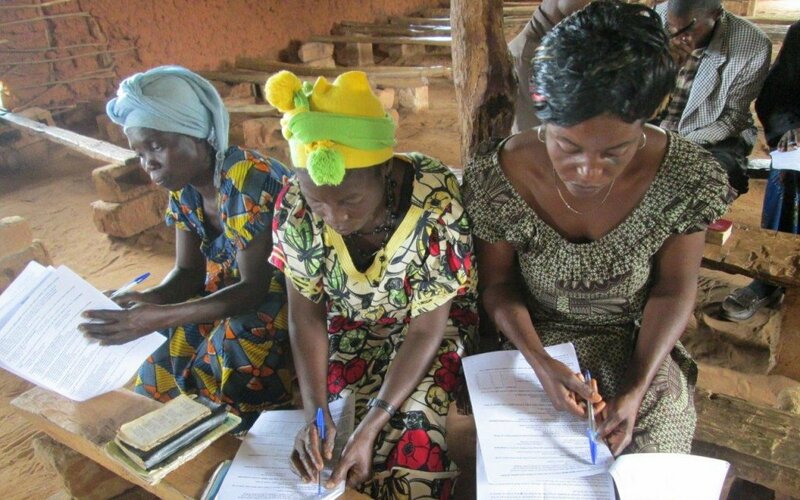 Even though the majority of members in Communauté Mennonite au Congo are women, they were underrepresented in the survey, due to illiteracy challenges. Most of CMC’s congregations are rural, including 40 that are quite remote. Reaching these congregations to implement the survey was difficult, even when traveling by motorbike. 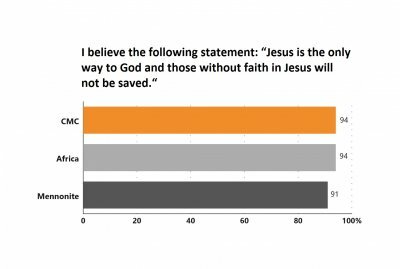 Twenty-one percent of members and 100 percent of congregations in Grace Community Church participated in the GAP. 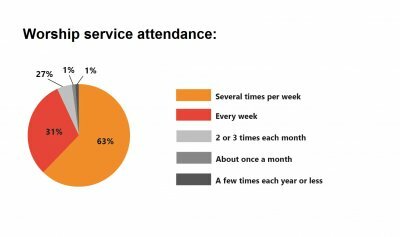 The average membership size of its congregations is 106 members. All of the members live in rural areas. 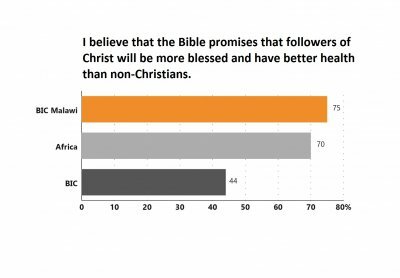 The average age of respondents is 40 years and 66 percent of members are between the ages of 18-45 years—the youngest church in Africa next to Malawi. 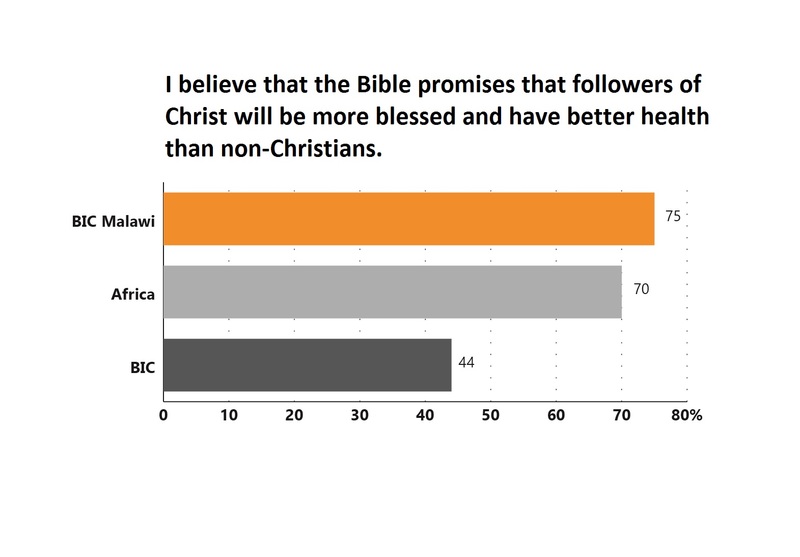 Only 49 percent are currently married—the lowest percentage among GAP African churches. Five percent are widowed, eight percent divorced or separated, and five percent living with someone to whom they are unmarried. One third identified as manual laborers, 16 percent as employed in government or politics or civic service, 16 percent in education, and only 6 percent identified as homemakers. Thirty-five percent are high school graduates—the lowest in Africa next to Malawi. 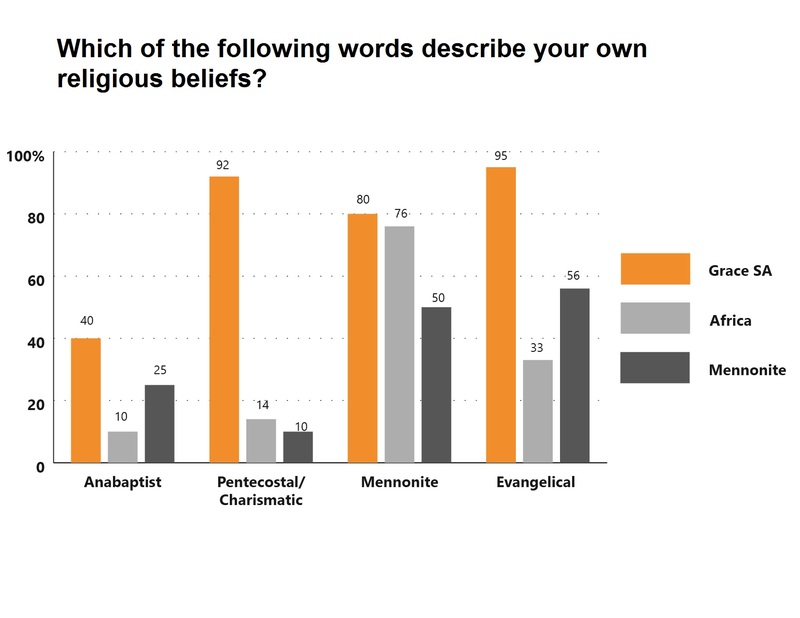 Thirty-two percent of respondents grew up in a home where one or both parents were a member of Grace Community Church. 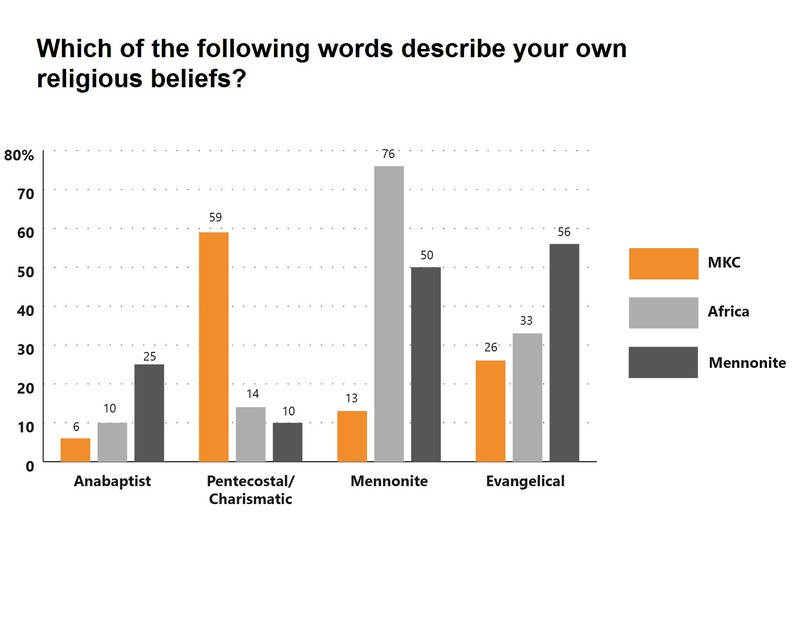 Forty-six percent of respondents were baptized in a denomination or church other than Grace Community Church. I think this is a good project for the church, to help us take stock of our direction and for obeying God’s call. Grace Community Church in South Africa was founded in 1987 by David and Nellie Makaleni, Fani Norgawana, and a number of others who left the Apostolic Faith Mission. The church was located in Philipstown, an economically depressed area that is heavily dependent on sheep ranching. Whites own the majority of the ranches, while the workers are primarily black Africans. The church’s early ministry focused on reaching workers on the sheep farms, and many of the early evangelists were farm workers. Sixteen months after its founding, Graham Cyster, a Mennonite from Cape Town, ordained the Makalenis for official ministry. Grace Community Church has since expanded beyond Philipstown to neighboring towns such as De Aar, Colesburg, and Hanover. 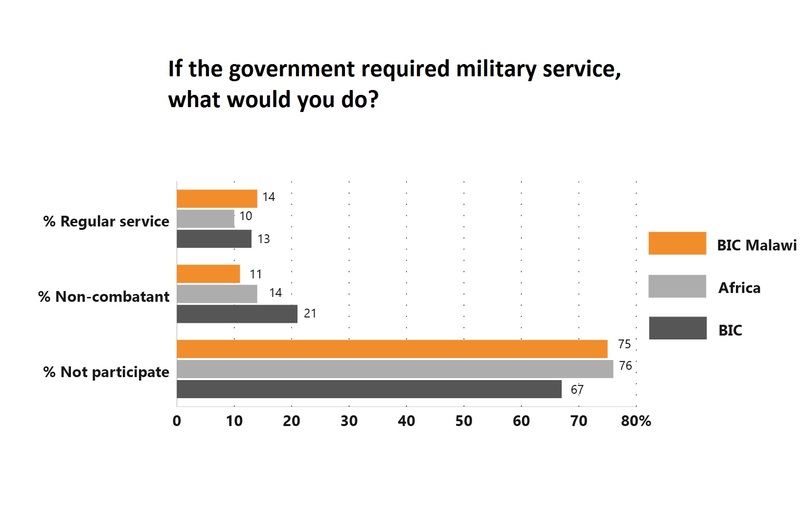 Farm workers were not readily available on weekends, when the survey was implemented. Four percent of members and 24 percent of congregations in Meserete Kristos Church participated in the GAP. The average size of congregations in the MKC sample is 282 members. Forty-three percent of respondents were women and 57 percent were men. 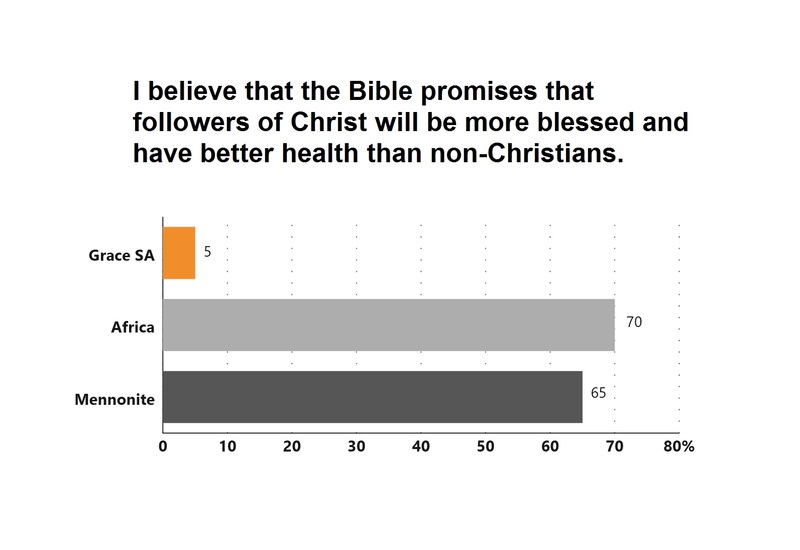 The sample was overwhelmingly urban—81 percent, which makes this sample by far the most urban of any in Africa. The average age is 45 years, with 50 percent of members between 18-45 years of age. 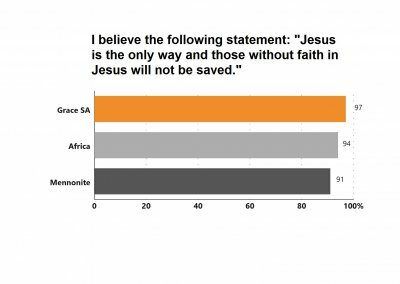 Thirty-two percent of this sample are single members while 56 percent are married, the highest percentage in Africa next to Grace Community Church of South Africa (34%). 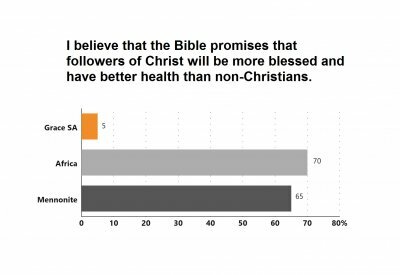 Nearly one-fifth (19%) of respondents are engaged in education, and overall, 46 percent are professionals—the highest among the African churches. 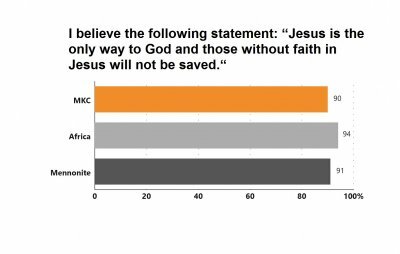 Thirty-eight percent are college graduates and 11 percent have advanced degrees—MKC is the most highly educated of any African church. 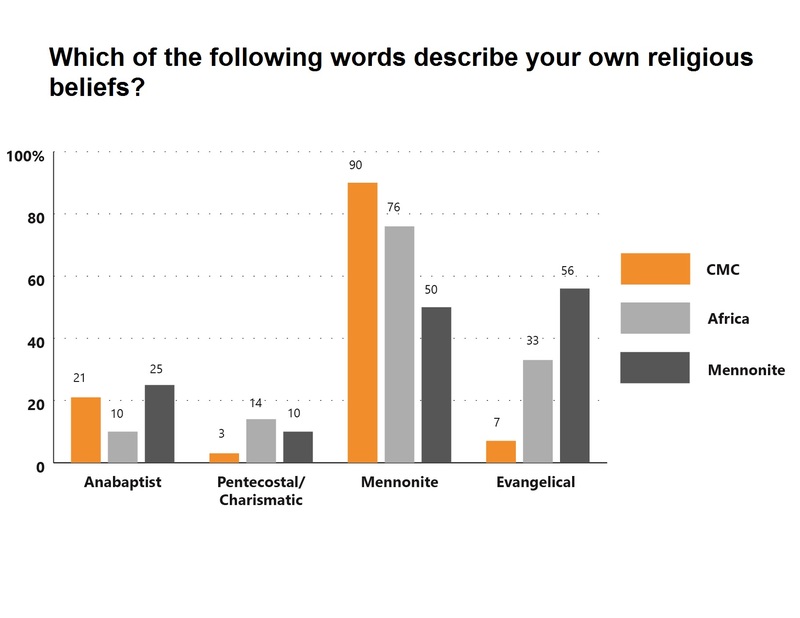 Forty-one percent of respondents grew up in a home where one or both parents were a member of Meserete Kristos Church. Twelve percent of respondents were baptized in a denomination or church other than Meserete Kristos Church. 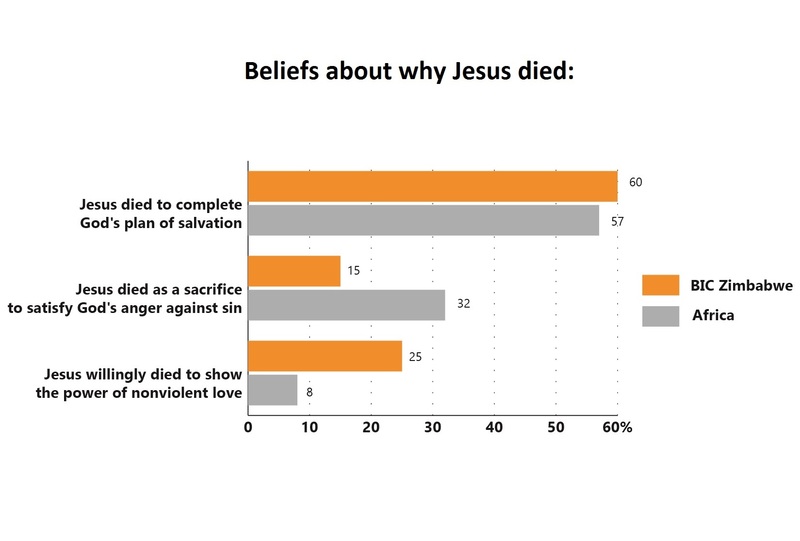 We are not sure how many of our church members know what we believe. 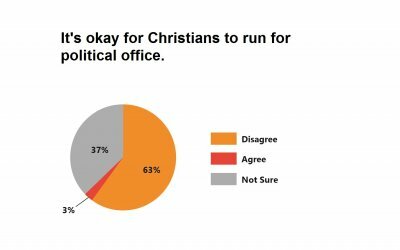 [The GAP results] can help leaders design programs, so that our members know what Christianity really means. 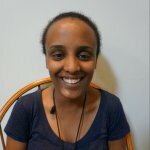 The Meserete Kristos Church traces its roots to the work of North American Mennonite missionaries, who first arrived in Ethiopia in 1945 to establish hospitals, schools, and churches. Growth in the early years was rather slow, until 1974, when the Communist regime known as the Derg took power. As religious restrictions in the country increased, the church went into hiding. In 1982, the government seized the church’s administrative offices, property, and bank accounts. That same year, MKC’s 5,000 members started meeting in small groups for worship and study, often at night. 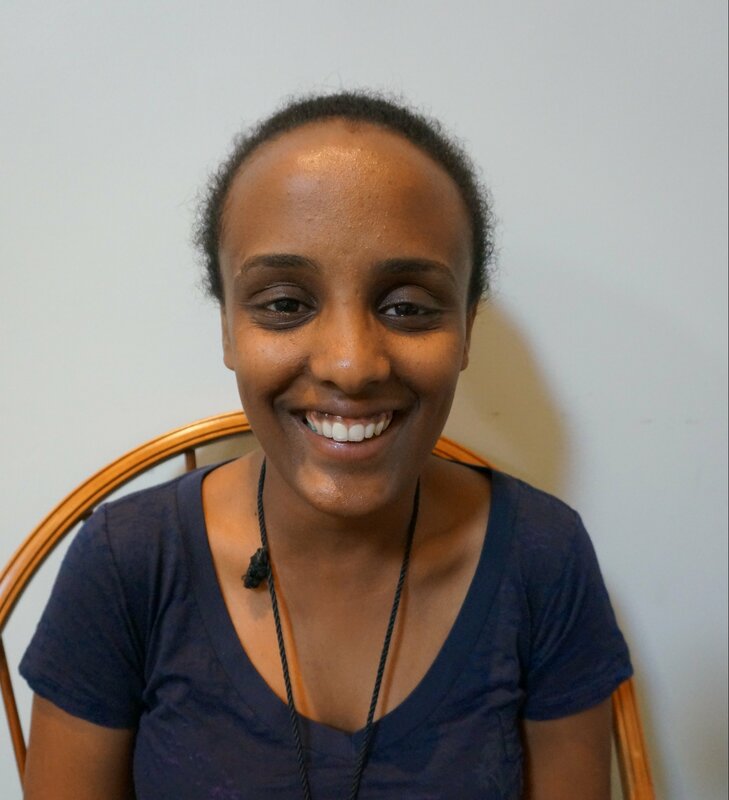 These home-based groups, initially limited to no more than five people, began to grow and divide. 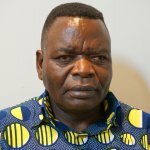 In 1994, after the fall of the Socialist regime, Meserete Kristos members gathered in a stadium to publicly congregate for the first time in twenty years, bringing in a total of 50,000 people. That same year Meserete Kristos College was founded to help train ministers and church leaders for the denomination. The church’s focus on leadership training, evangelism, and church planting has led to sustained growth over the last twenty years. A general presidential election and a major leadership transition within the MKC slowed down implementation of the survey and made reaching rural congregations even more difficult. 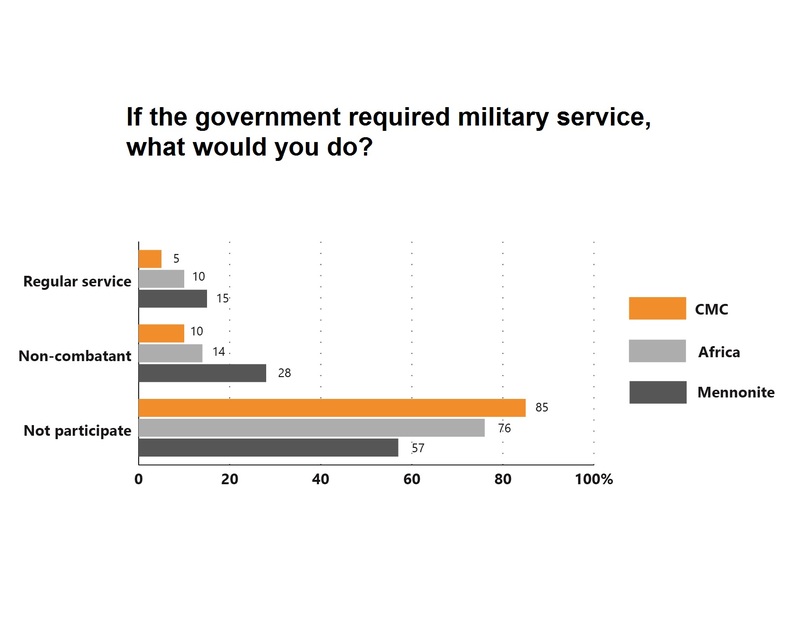 Data entry also required more volunteers than the denomination had originally anticipated. 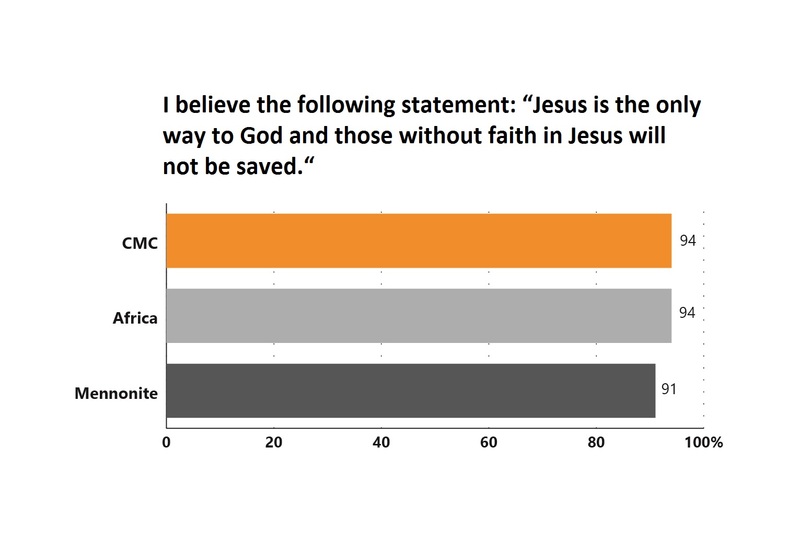 One hundred percent of congregations and 17 percent of members in the original sample participated in the GAP. 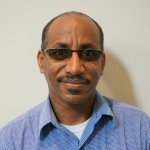 We do not have information about the average size of congregations in the Communauté des Églises des Frères Mennonites au Congo. Of those who participated in the GAP, 37 percent were women and 63 percent were men. Seventy-three percent of members reported living in rural communities and 28 percent in urban areas. The average age of respondents is 44 years and 53 percent of women are within childbearing age (18-45 years). Sixty-seven percent are married, 16 percent are single, five percent are widowed, 3 percent are separated or divorced, 5 percent are living with someone to whom they are not legally married, and 2 percent are in polygamist marriages. Forty-three percent are engaged in agriculture, 32 percent are professionals, 11 percent work in manual labor occupations, and 11 percent are in church-related careers. Just 3 percent are homemakers. Fifty-one percent have not completed a high school education. For 39 percent a high school diploma is their highest level of education, and 10 percent are college graduates. Sixty-one percent grew up in a home where one or both parents was a member of a congregation in the Communauté des Églises des Frères Mennonites au Congo. 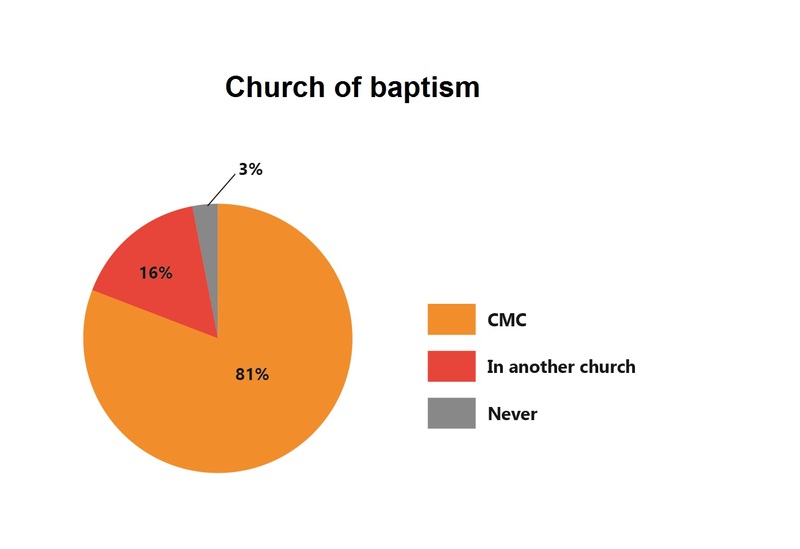 Eighty-three percent of respondents were baptized in a congregation of the Communauté des Églises des Frères Mennonites au Congo. This work was both an evangelism campaign and a missionary work. The time of worship [before the survey] prepared hearts for the survey. Nobody hurried up to go back home. God was at work. After the message of scripture in some places people converted and came to Jesus Christ. In 1920 Aaron and Ernestina Janzen resigned from their work with Congo Inland Mission to start an independent Mennonite Brethren mission in what is now Bandundu province. In 1924 they moved south to Kafumba, which became the main center of the Mennonite Brethren mission until 1964. Early missionary work included agricultural, health, and educational activities—wholistic emphases that have continued in the church to the present day. 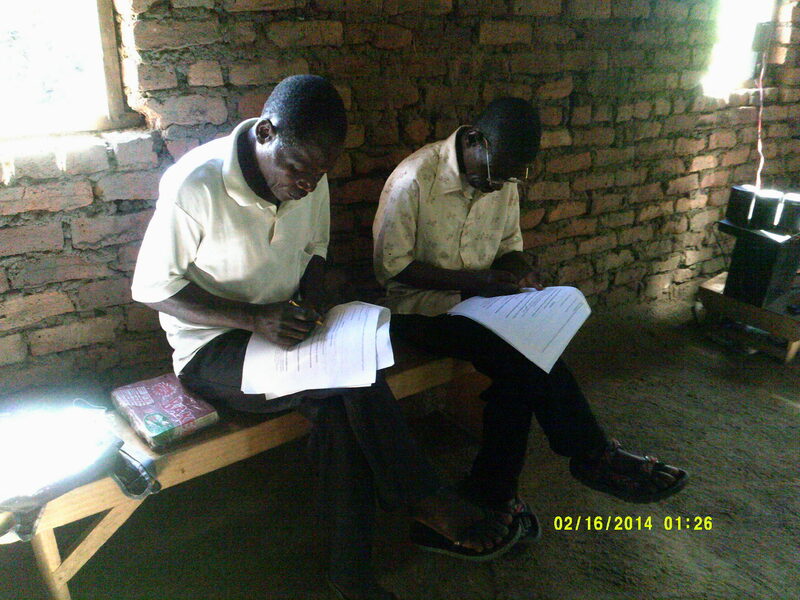 Congolese catechists, evangelists, and pastors simultaneously carried out the early evangelism and translation work. 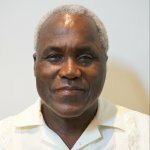 When Zaire became independent in 1960, the resulting rebellion led to the evacuation of North American missionaries and significant trials for Congolese church leaders, who faced threats and harassment from the revolutionary forces. The denomination became independent from the North American mission in 1971. 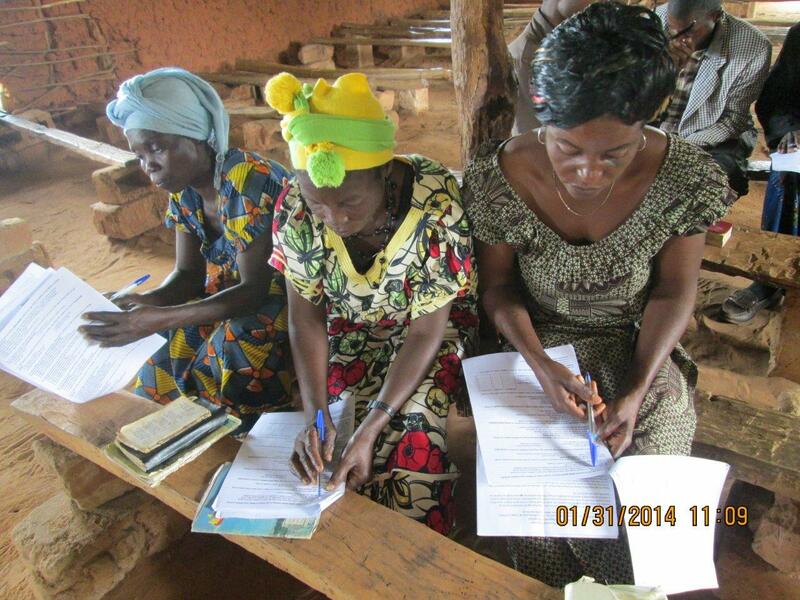 Today the CEFMC counts churches in Kinshasa and in the Kivu, Lower Kongo, Equator, and Kasai provinces, among others. Evangelism remains a central focus not just for the denomination as a whole, but also for individual congregations and members. 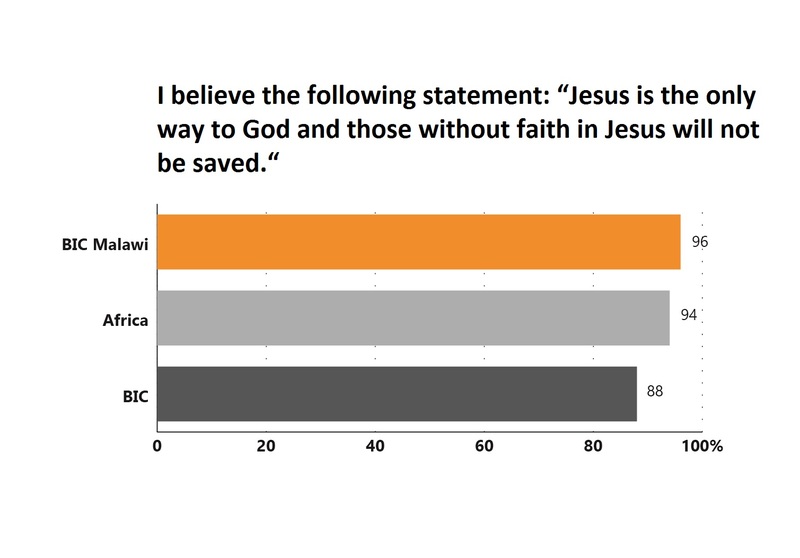 Church-planting has even led the denomination across the border into Angola. CEFMC also runs a Department of Health and Development that supports development projects in an effort to minister to the whole person. 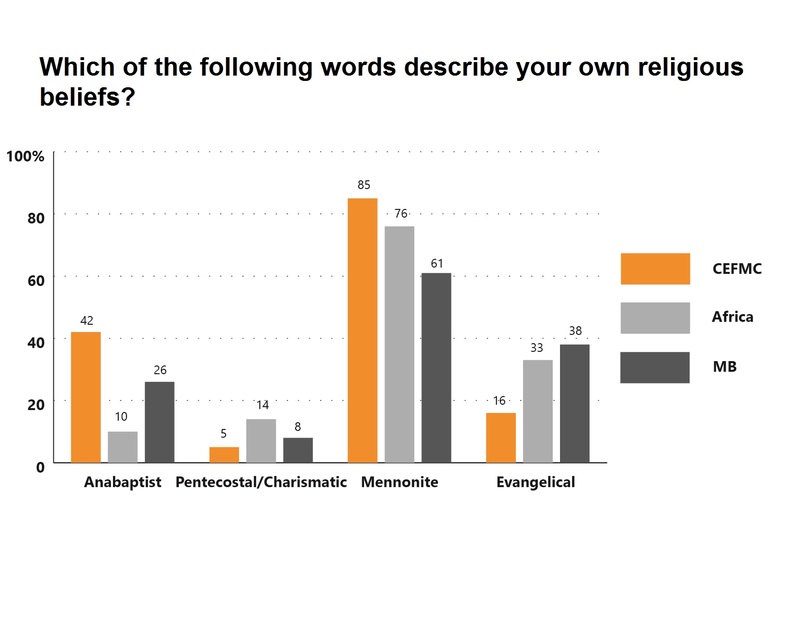 Some people were fearful that their answers in the interviews might not please church leaders. After they were shown letters of support signed by the leaders, however, they felt free to speak their mind.